What is it ? : Ezra has set up a heist with Hondo Ohnaka which will let the Rebels finally get their hands on the Proton Warheads they've been trying to get for a number of episodes. He reveals his partner, Azmorigan spotted an abandoned Imperial transport in the atmosphere of Wynkahthu where it will eventually drop into the storms and be destroyed. 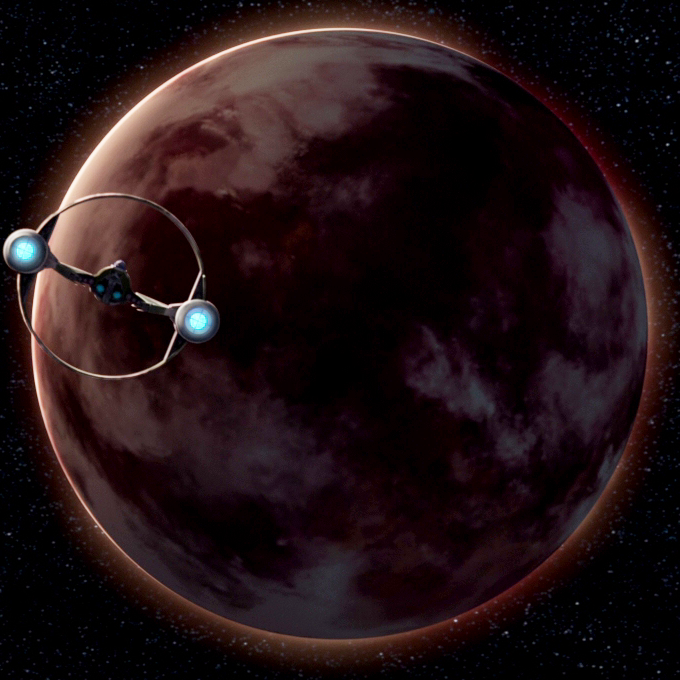 Hondo and Azmorigan will let the Rebels take the Proton Warheads, but plan to split the other cargo between the two of them, and lead them to the abandoned vessel. The storms stop the Ghost from docking, so Hondo, Azmorigan, Zeb, Ezra and Chopper drop onto the hull of the ship from above and make their way down into it. On their way through the ship they encounter Melch, the ugnaught who was Hondos partner before, and they discover this is the second attempt to get the cargo that Hondo has made, being forced to abandon his crew during the first. They reach the hangar bay, open the doors and fire cables locking onto the ghost, and begin winching the proton warheads across., when Hondo and Azmorigan begin arguing about which of the loot belongs to each of them, leading to Azmorigan marching off to search the rest of the vessel for loot. After a which, Ezra realises that Azmorigan hasn't returned, and as the vessel is getting closer to the destructive layers of the atmosphere, Zeb heads off to search for him, and is ambushed by a security droid. Awakening in the brig, he finds that Azmorigan is in the same situation, and calls Ezra to come and get them, they sneak back through the ship trying to avoid the security droid, but while they're hiding awaiting it's passage, Azmorigan cracks under the pressure, grabs Ezra's blaster and destroys the droid. The destruction of which activates all of the other Security droids aboard, which start attacking. They retreat to the Hangar, and discover that Melch is missing as well, but don't have time to search for him, and Hondo and Azmorigan jump aboard the single container of loot that they continue to squabble over and are winched to the Ghost. 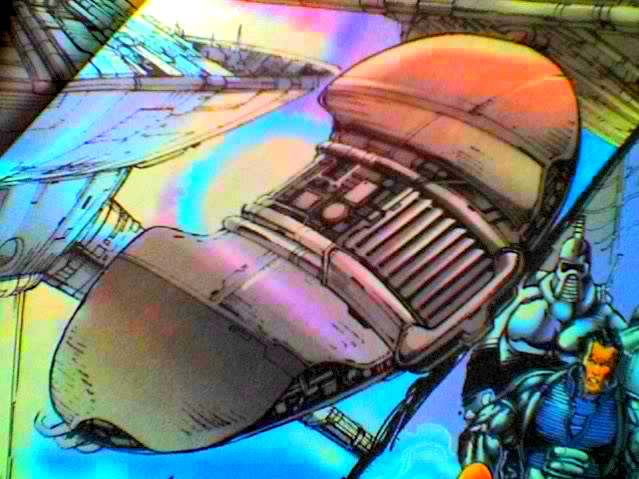 Chopper uses his thrusters to get back to the Ghost, leaving only Ezra and Zeb, to leap aboard the final load of Proton Warheads, but the attacking droids sever the cable, dropping the container into the planets atmosphere. Zeb manages to grab onto the broken cable as they fall, and with Ezra on his back deflecting incoming blaster fire from the security droids, they scramble back up to the Ghost, which is getting dragged down into the dangerous storms by the remaining cable. As the transport vessel is torn apart by the atmosphere, Zeb and Ezra return to the safety of the Ghost, and Kanan severs the final cable, freeing the Ghost to return to the safety of space, as they see the transport destroyed only moments later. Hondo and Azmorigan open their container of loot, only to discover that all it contains is Melch, who feared being abandoned by Hondo once again. Hondo feigns delight over the safety of his crew, but the squabbling continues as Azmorigan demands 50% of Melch as his share. High Points : Hondo is always worth the time to watch, and gets some great lines in this episode as always. A-ha! Because we have something in our favor that the Empire does not, for we are desperate! 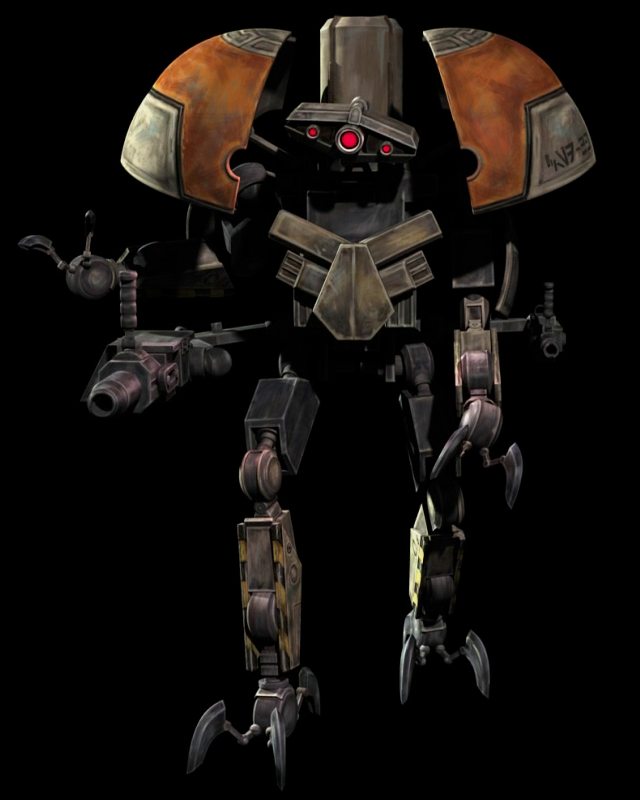 The introduction of the Dark Trooper styled security droids are great, not only do they provide that little bit of continuity with the Legends universe, but they're actually used very effectively. I just also draw attention to the animation, during the scenes in the hangar bay, with the door open and the Ghost barely visible through the misty atmosphere, it looks great. Really giving me the feeling of them being somewhere weird, the wind whips by as the two ships descend into the planet's atmosphere. Although it's a little strange that the air is breathable, I still loved these scenes. Finally I'd like to draw attention to the fact that a number of episodes this season have all been about the Rebels trying to get ahold of Proton Warheads, that they require for their plans to at some point destroy the manufacturing plants on Lothal. I really like that this seemingly tiny point of getting explosives has been a driving force for much of the season, and that it ties all of the stories together instead of everything being stand alone as it first seems. Low Points : I'm not a fan of how Hondo fails to profit from this heist, it feels a little too like a heavy handed message. 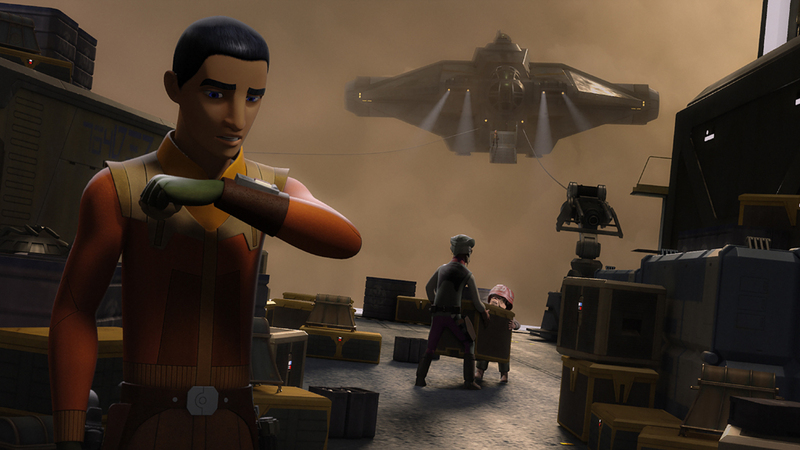 It's fine for the Rebels to loot the ship for explosives, but Hondo the criminal shouldn't profit from his activities. This seems to be a bit preachy for my liking, and it makes me wonder how you can be judgemental about criminal activity when your main characters are killers and terrorists if you really look at it. I'd also question the action at the very end, Zeb and Ezra are clambering up the severed cable after the security droids have shot through it, however the other cable is dragging the Ghost down into the atmosphere towards destruction, and not until Ezra and Zeb are aboard can Kanan sever the other cable and free the Ghost from being dragged down. But, why? If he cuts the other cable, theirs is still attached, and they can still climb aboard, it seems to be done just to induce some tension, when in reality there's no reason for them to be in danger at all. So what do you really think ? : I've been feeling a little lackluster about the Rebels episodes lately, but this one is really enjoyable, there's some solid character motivation, good dialogue, and excellent action. Hondo is great as always, and Azmorigan provided some great moments, with his previous relationship with the Spectres being the subject of a laugh or two. Final Words : So the Rebels have the explosives they need for their plans on Lothal, I'm hoping we see the action move back to Lothal, it's really provided a great setting for the series and I definitely feel more of a connection to it than I do to the Rebel base on Attolon.